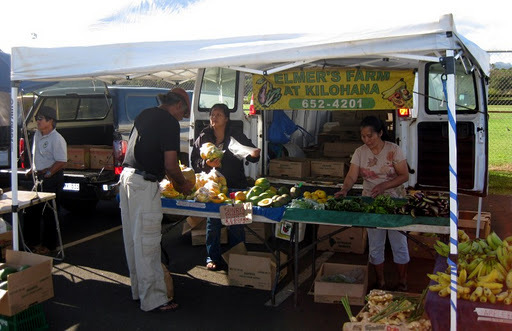 We always like to check out farmers' markets when we travel. 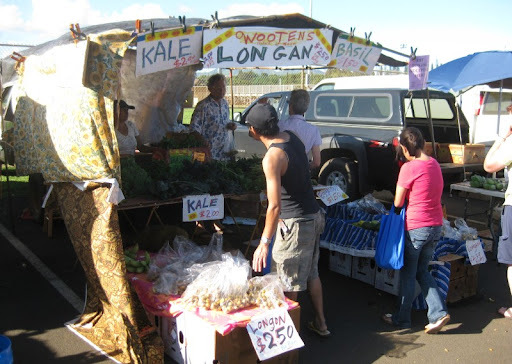 It makes for a fun outing, gives you insight into the local produce and as a bonus you come away with good stuff to eat. Saucisson MAC told us that his favorite market on Kauai is the Wednesday afternoon market in Kapaa. We trust Saucisson MAC, so Kapaa it was. We were not disappointed. 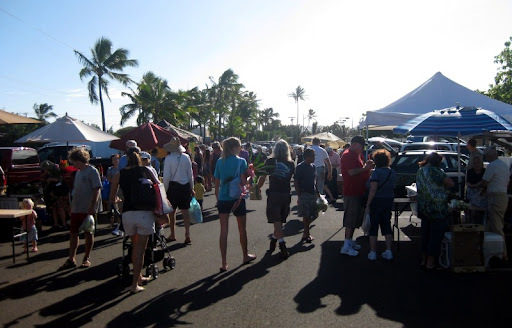 It was a beautiful, sunny afternoon and the market was bustling. The produce was plentiful and a completely different selection than we get in San Diego. 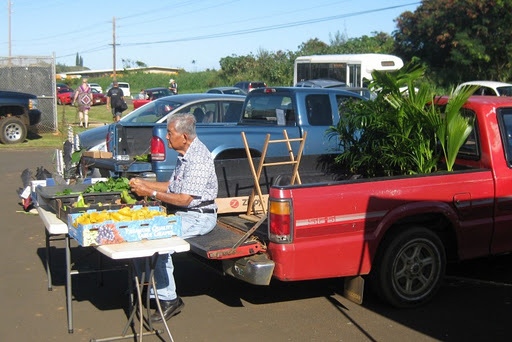 We were happy to find that, like our own local market, it was all produce vendors and not overrun with prepared food stands (the closest thing were hacked open coconuts with a straw). Most of the above should be pretty recognizable, except maybe for the little guys up front. While wandering through the market, I saw a stand selling "longans". I had no idea what a longan was. When I inquired, they gave me a couple to taste, and I immediately purchased a bag. When you apply pressure and twist, the outside skin pops open, revealing the fruit - a white globe with a seed in the middle. They taste heavenly. What a score! I love fresh logans, sometimes more than lychees. Dried logans look a lot like raisins since the meat turns dark brown. You can find logans at 99 Ranch usually. Probably not as good as the ones in Kauai. Hi CAB - I'll definitely keep my eye out for longans the next time I go to Ranch 99 - thanks for the heads up! 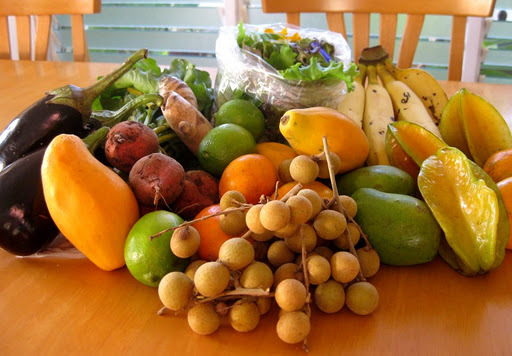 Hi Mike - If you do get lychee or longan from 99 Ranch Market, make sure they weren't shipped previously frozen. Our neighbor had both a lychee and longan tree in their driveway. While you're at 99 Ranch try some of the small bananas, they are more starchy, but not as sweet. 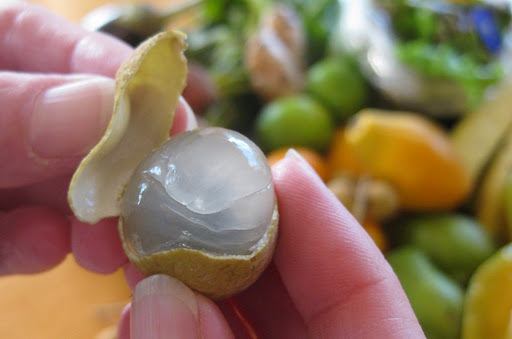 Hi Kirk - I can imagine how freezing could mess up the texture of a longan. 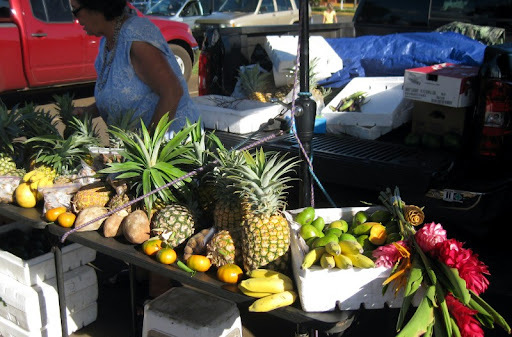 We'll give the small bananas a try - I really liked the smaller varieties in Hawaii. Hey Mike - I saw longan at the Hillcrest Farmer's Market this past weekend. Interesting - I guess that means they are able to grow them around here?